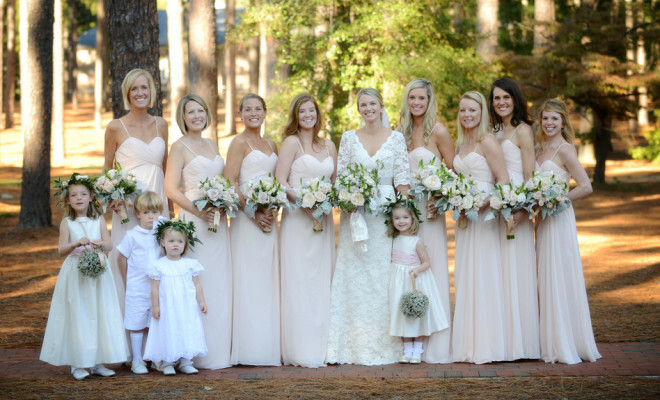 Most brides and grooms think that they have to have formal attire in order to have an elegantly dressed wedding party, but classic styles that can be worn again for other occasions can be just as beautiful. Many times these fashions are less expensive, and your bridesmaids and ushers will feel more comfortable. You can actually have floor length dresses without choosing formal gowns for your girls to wear. Choose styles that can be shortened later on for other occasions. Look for dresses in your wedding colors, but avoid sequins and beading that will be too flashy for every day functions. Ask the bridesmaids to pick shoes in a neutral color, but let them pick the style. No one wants a pair of shoes they’ll only wear once. For example, ask them to buy white shoes, but let them decide if they want heels or flats. A basic suit is always stylish and can be worn for other functions later on. Tuxedos are nice, but they are often expensive for one day of use. Black suits can have a very formal look, especially if all of the men have matching pants, shirts, and jackets. Just like you did for the girls, ask them to all pick shoes in a specific color but let them choose the style. Men’s skinny ties can be used to coordinate their look with the bridesmaids’ dresses. Online retailers like Necktie Emporium offer a variety of patterns, stripes, and solids. Ring bearers and flower girls are adorable no matter what they wear, but you can still achieve a formal look with clothes that are comfortable and affordable. Children outgrow their clothing quickly, so the trick here is to find something cheap. Look for their outfits after holidays like Christmas or Easter. Little suits and dresses are often drastically discounted during these times of the year. Your wedding party will appreciate the comfort and affordable price of these clothing options when it comes to your big day. Best of all, you won’t be sacrificing that elegant look you are after. One day you will look back at your wedding photos and be glad you chose a classic style rather than the latest trends in formal wear.